When I heard that Ana Fabiano would be appearing at the Wine Media Guild’s April luncheon, I was jazzed. Last year, I’d picked up her book The Wine Region of Rioja—and didn’t put it down. The photos alone had me flipping through all 240 pages to drink in the stunning scenery, captured in all its sublime, rugged glory. On a design level, this seemed a coffee-table book; its roomy photo spreads and spacious body font make it easy on the eye. But then I delved into the text, and the content was surprisingly, satisfyingly meaty. Fabiano covers the place and its geography, its rich history, the millennia-long development of Rioja wine, its aging classifications, its modern iterations, and the key bodegas. She does so with an economy of words, but with enough depth to offer new information to Rioja aficionados like me. Having been to the Yuso and Suso monasteries on our Rioja Roundup tour, I particularly enjoyed her synthesis of religious and viticultural histories. She ties Rioja’s emergence to the cave-dwelling mystics, who gave rise to the powerful monasteries in the 11th century, which in turn built Rioja’s wine infrastructure—expansive vineyards for sacramental wine; roads and bridges to transport pilgrims and wine; and an internal communication system between monasteries in the region that precipitated the spread of information on vineyard care and winemaking techniques. 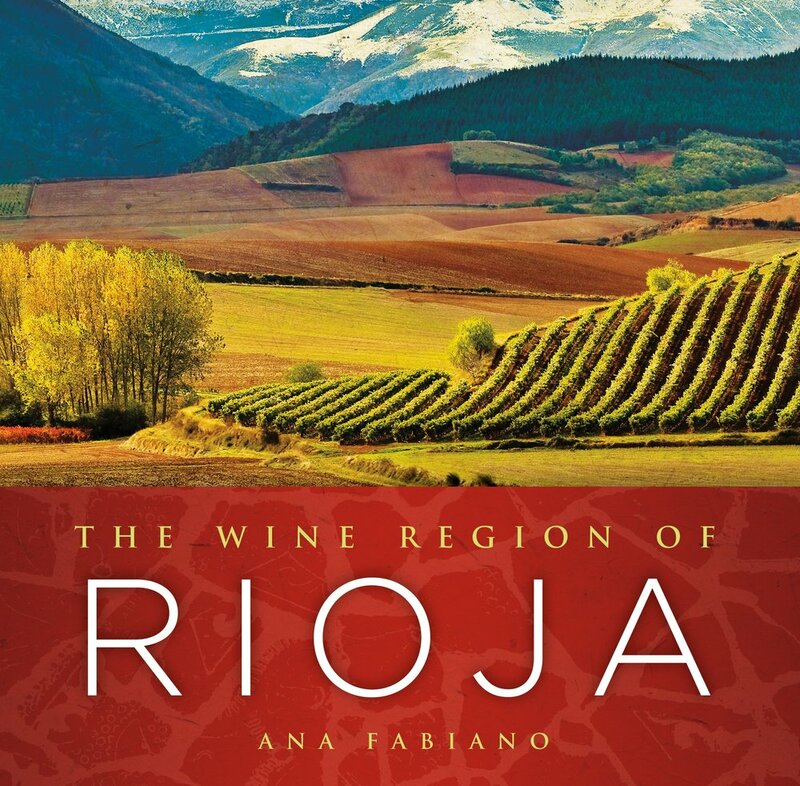 Fabiano’s book was, in short, an excellent companion to what I consider the benchmark book on Rioja, The Wines of Rioja by the late John Radford. Before lunch I hastened to tell her all this. My comments were music to the author's ears, it seems, for minutes later, she recounted our conversation in her opening remarks, saying I’d “expected the book to be fluff” (on hearing this, I nearly choked on my breadstick; fluff wasn’t a word I’d used), but she was truly pleased that a reader like me had found the book to be everything she’d intended: information-rich, comprehensive, and travel bait for the Rioja enthusiast. Why wouldn’t we learn from her? Fabiano has impressive creds as trade director at Vibrant Rioja and brand ambassador for the DOCa Rioja, who has devoted the past 23 years of her life to Spain. She got her feet wet during a junior year abroad in Madrid in 1980, when Spain was crawling out from under the rock that was General Franco, blinking in the light of democracy. In writing this book, she relied on 20 years of personal notes, new interviews with several generations of winemakers, and old documents unearthed from the archives. With her knowledge of Castilian, Fabiano was able to access people and documents that were previously unutilized in the English-language canon on Rioja. And she tapped into a pool of very talented local photographers, whose magic-hour images suggest they were ready to pounce whenever the light was right. My favorite four (just to narrow it down) began with the very first red, a 2008 Crianza from Bodegas Ramirez de la Piscina ($15). This winery was a new acquaintance. Located on a side road near the village of San Vicente de la Sonsierra, they’re within the radius of our Rioja Roundup tour, I’m happy to learn. Though aged 15 months in oak, this crianza represents that juicy, fruit-forward, quaffable style of young Rioja that’s so lip-smackingly good. It’s a consistent prize winner, and I’m not surprised. Another favorite was Beronia. I liked their 2008 Reserva ($21) well enough during the walkaround, but absolutely adored the 2005 Gran Reserva ($33) at lunch. The dry oak tannins and tart fruit of the younger vintage had here mellowed out and cohered into a complete, beautiful wine. (No wonder it got 93pts from Wine Enthusiast.) Fabiano calls its style “Modern Classic,” with a preponderance of tempranillo (90%) in the blend and some French oak added to the American barrique that’s historically used in Rioja. Another Modern Classic was the 2005 Muriel Reserva ($21) from Bodegas Murielin Elciego, long-time grape sellers who started bottling under their own name in 1986. With a delicious dark-chocolate cloak around a berry core, this 100% tempranillo was my top wine of the tasting and a favorite of many other attendees. I was glad to see Faustino here—like spotting an old friend in the crowd. Despite its huge production (20 million bottles), this family-owned, centenary winery (f. 1861) manages to maintain a high level of quality, as we’ve discovered on various visits to their Oyón estate. We tasted their 2000 Gran Reserva ($38), a tempranillo/mazuela blend, which falls in what Fabiano calls Rioja’s “Classic” style (i.e., sourced from parcels in all three subzones and blending tempranillo, mazuelo, garnacha, and/or graciano, Rioja’s classic quartet). Compared to the other wines, this one had greater tannic grip and a more austere character. 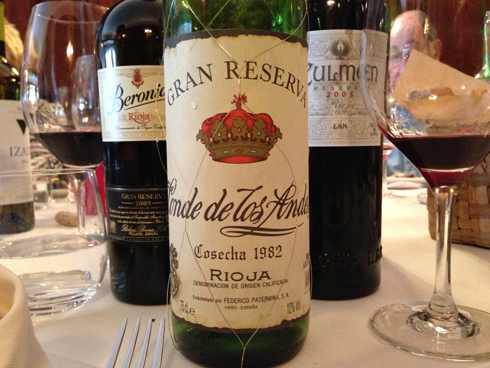 Its age—now 13 years—was showing nicely, with notes of tobacco, tomato leaf, and earth. As Fabiano repeatedly pointed out, the Gran Reservas are some of the best price/quality values around. I’d second the motion. And the 2005s were all stunners. I suspect I’ll be making extra room in my suitcase for those next fall.